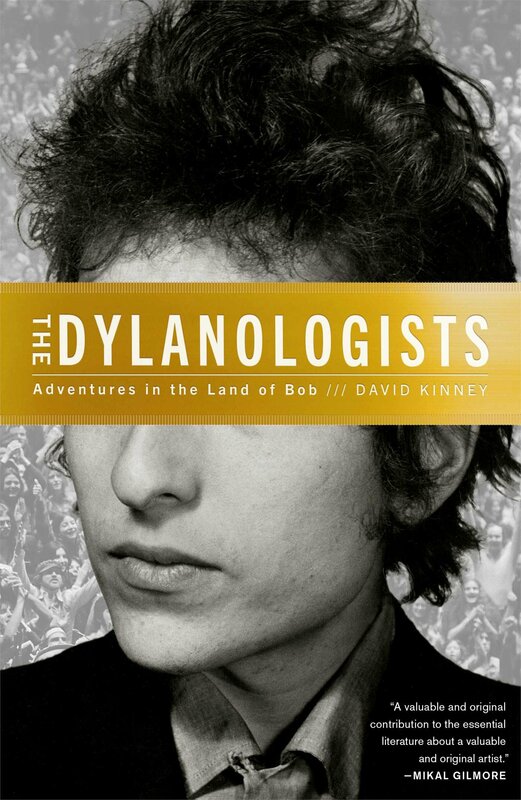 I finished reading David Kinney’s new book, The Dylanologists: Adventures in the Land of Bob, yesterday. In some ways it violated the conceit of this blog, because there was a lot of talk about what I think of as “future Bob” or the “Dylan who has yet to be” in terms of this writing project. Overall I think that it’s good, but it’s not essential. Parts of the book are very appealing. He does a good job with a lot of his material, and Kinney writes well. He jumps around, forward and back, from character to character, and this creates a fair bit of interest and mystery in the volume. If there is a drawback, it probably comes from my own expectations and hopes. By interviewing many of the world’s best known Dylan collectors, for example, I was hoping for more details about the nature of their collections and their processes. There are many hints of this – descriptions about the culture and practice of those who record shows, for example – but I personally would have liked a lot more of it. Certainly the best chapter in the book is the one about the study of Dylan’s “plagiarism”. This is a complex and vexatious story that I will deal with around the time of Love and Theft and of Chronicles. Long story short: the Dylanologists have demonstrated a remarkable degree of citation in Dylan’s late-period work, and now wonder what it is that he’s trying to communicate. The Daily Beast ran a pretty good overview of the whole thing, if you don’t have time for the book. The most striking thing for me is the feeling of decline. Kinney is talking to today’s fans, and while many of them seem to have an almost religious attachment and devotion to Dylan, he also talks to many who were once the most rabid Dylan fans, but who have lost their faith. I don’t see much of myself in these people at this point in time. Yes, it is true that I hope Dylan’s current tour will bring him somewhere close enough to me that I will see him perform this year (he has just announced his tour will take him to Australia, that doesn’t help), but it is more out of intellectual curiosity than from a genuine desire or excitement to hear him play again. So, not yet a Dylanologist. Working on it. I did note a factual error, so maybe there’s hope for me…. Bob Dylan did almost nothing for me to write about in 1982. He apparently recorded with Allen Ginsberg, but I don’t have that (I’ll look). He recorded some duets with one of his back-up singers (Clydie King) and this is listed by Bjorner as “not circulating”, which is too bad, because the idea of Dylan doing an album of duets is, well, fascinating. Here’s what Dylan did in 1982 that I can write about: He appeared at the Rose Bowl in Pasadena on June 6 at the “Peace Sunday” anti-nuke concert during Joan Baez’s set. You can watch his entire performance here (note: the video drops out a couple of times on “With God On Our Side”). You should go watch this whole thing. I’ll wait. The bootleg of this performance includes the entirety of Baez’s set: “Do Right Woman”, “Warriors of the Sun”, John Lennon’s “Imagine” (which she introduces as a song from the 1960s, which bothers me much more than it has any right to), and “Diamonds and Rust”. 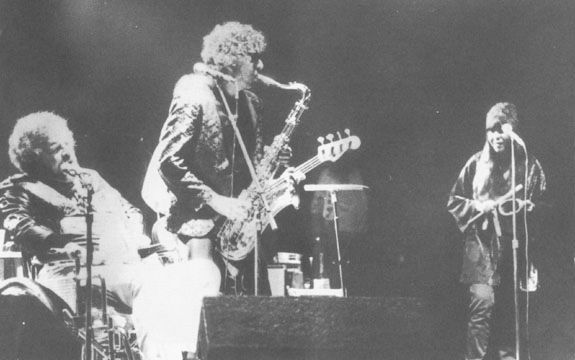 She then introduces “Robert” and Dylan sort of belatedly shows up on stage for his only public appearance in 1982. It is good and bad. 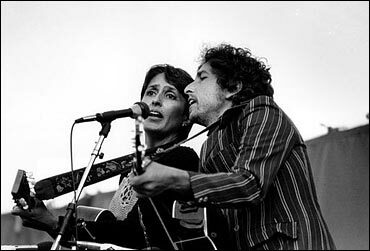 On the one hand, here we have Bob Dylan and Joan Baez together on stage again after all these years. It is a beautiful moment for those of us busy tracking their bizarre, decades long friendship. Six years after the Rolling Thunder Revue, about seventeen years after she helped to make him a star, here comes the middle-aged Dylan out to perform with her. His acoustic guitar and harmonica holder (he doesn’t actually play the harmonica). It’s a wonderful moment. On the other hand, it’s all a bit of a shambles. The tuning of the guitars at the start. Dylan standing too far from the mic (she cedes him some space so that he doesn’t have to crash into her when he leans over). His guitar straps breaks (2:30) and the whole of “With God on Our Side” is sort of derailed. It’s not entirely clear that they are yet on the same page on this song almost twenty years after they were playing it for the first times. I mean, how many times can this duo butcher this song? On the one hand, I love how happy people seem to be. Skip ahead to 9:34 and watch Joan Baez smile. It’s a great moment. Whatever has gone on in their relationship over two decades, it’s wonderful to see that smile. On the other hand, she is smiling at the end of a cover of Jimmy Buffet’s “A Pirate Looks at Forty”. Jimmy Buffet. Joan Baez and Bob Dylan are on stage singing a Jimmy Buffet song. Seriously. What’s worse (and you’re wondering, how can it be worse?) they are doing a really, REALLY, bad job of it. Look closely, it is clear that Dylan has the lyrics written on his left sleeve. Watch Baez as she leans over to read them. She is constantly coming in late (she has done this with Dylan forever, possibly because he’s so mercurial in the way he plays things). It is sloppy and actually sort of painful to listen to. Go to 8:50 and you can clearly see both of them reading as they play. Actually, Baez just gives up and starts humming. Oh well. On the one hand, they do “Blowin’ In the Wind” together, and all is right with the world. On the other hand, they absolutely murder it. It is terrible. Awful. Horrendous. Look: “Blowin’ in the Wind” has three verses. Three. It is not a complicated song at all. Four chords, three verses. In fact, it’s so uncomplicated that between the first and second verses Baez says to the crowd: “Sing along, you know the words”. Except Dylan doesn’t. As they start the next verse, she sings the first line to the second verse, and he sings the first line of the third. She rolls her eyes and gives way, switching over to match him. It is a THREE VERSE SONG and he can’t get it right. Oh, man. So, to sum up, in his only 1982 performance, Bob Dylan comes out at a peace rally, sings three songs. On the first his guitar falls off and on the second and third he doesn’t know the words even though one of the songs is the most iconic thing he has ever written. Wow. On the one hand, the video of this performance is terrible – a dub of a dub of a VHS recording (the audio recording is far superior). On the other hand, just seeing these two people out there trying to do something – and, in particular, seeing Baez’s flustered exasperation, makes me inordinately happy. That’s it. That’s 1982 in a single post! “Once you own Bob Dylan’s highchair, it becomes easy to rationalize any other purchase”. So writes David Kinney, in his recently released book The Dylanologists. And I suppose it is true. Last night, at a party at the conference I’m attending, someone asked me if I had become a “huge Dylan fan” while doing this project. I said that I didn’t think that I had, that I still sort of saw this as a research foray rather than a calling or a compulsion. But I had to admit that I can feel the compulsion starting to come on. When I turn the page onto a new week, like 1981 last week, and realize that even though they were all recorded, I’m not going to be able to listen to all those dozens of shows Dylan performed that year. What, I wonder, will it mean if I listen to the wrong one? What if I miss out on the best thing? The sickness lurks in the background. Kinney’s book looks at the people who have the full-scale sickness. When Zimmy’s, the Dylan-themed restaurant in Hibbing, MN, was put up for sale earlier this year I joked about buying it (to the people on Facebook who thought I was really doing it: I’m sorry!). I haven’t thought about traveling there, and I haven’t thought about going to the Dylan-fest there (this weekend! ), but I sort of am starting to get the people who do. After all, I have opinions on which are the good 1981 shows. I really do! The Dylanologists is great so far, but I’ve only read a very little bit. I’m trying to save it. Savour it. 1982 has so little Bob in it. One concert, only a few songs. I haven’t even listened to that concert yet, because – and this is where I know I’m in trouble – I don’t want to waste the opportunity to listen to it for the first time. The sickness moves closer. So, I’m going to ration what little Dylan I have for this year. My understanding is that he retreated for a while in the summer of 1982 in an attempt to reconnect with his kids, taking them back to Minnesota, where, every year, people gather at Zimmy’s in the hopes that he’ll come round. It’s your birthday, and you’re seventy-three! Were I not traveling this week and in day-long meetings, I might have broken my comments on Dylan’s 1981 tour of Europe and the United States into a series of posts, but I’m going to amalgamate a few things in order to produce a bit of a scatter-shot assessment of the 54-show tour. First off, this seems to be a pretty strong tour. Most of the European tours were recorded by Dylan’s own crew, which means that there are an awful lot of high quality bootlegs out there to choose from. The set list itself is not that much changed from late 1981 – opening with some gospel material before segueing into older material. 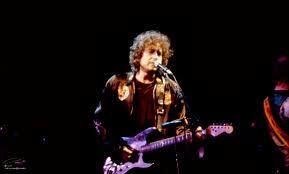 By mid-July Dylan dropped the show’s opening with the back-up singers performing gospel music on their own. But the singing is still strong and the band is pretty consistently good for the most part. A few shows seem particularly noteworthy here. “I’m gonna try to play this”, Dylan tells his Boston audience. At the November 10 show in New Orleans, from which the live version of “Heart of Mine” on Biograph is taken, Dylan plays his final (?) gospel song, “Thief on the Cross”. This is a song that he performs only this once, and which he never seemingly recorded. Clearly the born again phase is winding down by the end of the year. It’s actually a pretty good song. Sadly, the last show of the European tour, in Avignon, France, is the most tragic of Dylan’s career. While the band plays the opening song, “Saved”, a fan falls into electrical cables and is electrocuted. 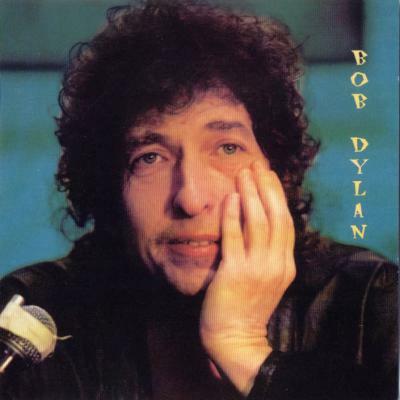 With the stadium blacked out, Dylan and the band jam acoustically for a while, but in the darkness a second fan falls from a wall, and she also dies. 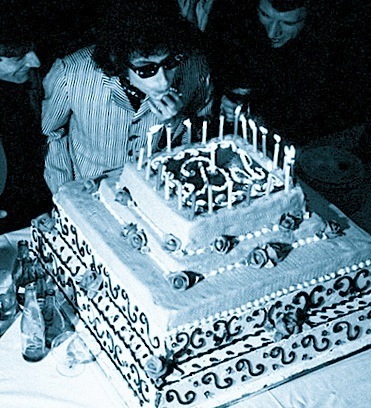 Dylan apparently was not aware of any of this, as he and the band played a lengthy show after power was restored. The final show of the tour, in Lakeland, FL on November 21, was one of Dylan’s longest up to that date: 27 songs, six of which were explicitly religious in tone. This would mark the end of Dylan’s touring for more than two years. He would play only one concert in 1982 and one in 1983, both times as guests of other musicians. He returned to the stage with a European tour in 1984 with Carlos Santana, but this is the end of the live bootlegs for a few weeks. Too bad. There are some real good ones here. I sort of became a little obsessed with them, frankly, hence the trivia dump that has been this post…. Here’s four home videos from the tour strung together seemingly randomly. I think the “Mr. Tambourine Man” is from Avignon based on the shirt. I know that the cover of Dave Mason’s “We Just Disagree” is from Merriville, since that was the only time he played it on that tour. I don’t know where the “Watered-Down Love” or “In the Summertime” are from, but I do know that the latter sounds a lot better here than it does on the album. The outtakes are always the exciting part of the week. So much hope, so much promise. So much disappointment. More than most musical artists, Dylan has had his recordings thoroughly excavated by bootleggers. It is genuinely shocking to read “does not circulate” on Bjorner’s site about some Dylan recordings (including some of his only sessions from 1982, for a project that sounds fascinating in the abstract). Between the Bootleg Series, and the actual bootlegs it seems that almost every significant thing that he put to tape is out there somewhere, and a lot of insignificant ones as well. This week’s outtakes were entirely from the period between Saved and Shot of Love. Indeed, the best of them is called From Saved to Shot, so that’s pretty plain. The other, Studio Working Tape, seems to be well-referenced across the Dylan literature, and is from the same era. Studio Working Tape is, to me, the lesser of the two. There is some overlap in terms of the songs on both (I haven’t listened back-to-back closely enough to actually determine if these are actually the same recordings, but I think so). “Is It Worth It?”, the opener on this bootleg, is a really good song that would not have sounded at all out of place on Shot of Love, and actually probably would have improved the album somewhat. Not a huge amount, but it’s better than something like “Trouble”. The song that is tagged here as “Ah Ah Ah #1” (for the chorus, which is basically Dylan and his back-up singing “Ah ah ah”) also had a lot of potential. “Hallelujah” doesn’t really go anywhere at all, while “Magic” is better, and, I think, was considered for Infidels but left off. That one sounds like someone from the early-1980s that I cannot put my finger on. Frustrating. Most of the rest isn’t that interesting. There are a whopping ten instrumentals on the bootleg, which indicates that it really was what it said it was: a working tape. You get a lot of Dylan “la la la-ing” in the place of actual lyrics that had yet to be worked out. Initially I thought From Saved to Shot was better than both of those albums, but I don’t actually think that is the case in the end. It does have some excellent material (again: “Is It Worth It?”). Here “Ah Ah Ah #1” is identified as “Highway”. The versions of “Heart of Mine”, “Watered-Down Love”, and “Shot of Love” that can be found at the end of the bootleg are all at least as good as the versions found on the album Shot of Love, and “Heart of Mine” is probably better (though his singing is a bit bizarre, he’s singing in a higher register than ever before, and it is, well, creepy). There is a lot of quality material to be found here, although “Every Grain of Sand” and “Groom’s Still Waiting at the Altar” probably elevate the album above the bootleg. Both bootlegs have strong moments, but they also have a ton of fluff on them. This is where the curated approach of the Bootleg Series of Biograph becomes much more appealing overall. Sometimes it makes sense to let other people go through all of this material on your behalf and tell you which is the good stuff. Which is what I suppose some of my readers are doing right now…. It’s only Wednesday of 1981, but I’m calling it on Shot of Love and moving on to some of the bootlegs. This was an album that I had had no exposure to before Sunday morning when I listened to it for the first time, and it is an album that I probably won’t be going back to much again. This album has two tremendous songs: “The Groom’s Still Waiting at the Altar” and “Every Grain of Sand”. Pretty much everything else I have some troubles with. The first time I listened to the album I thought that it might be a contender for “worst ever status”. It’s not that bad, but it’s certainly the worst of his three born-again albums. 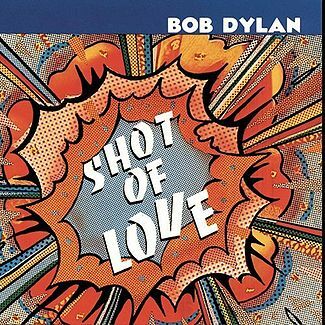 In a 1983 interview with NME, Dylan will call “Shot of Love” “my most perfect song”. Wow. This is a hard concept for me to wrap my brain around, since I find it both musically and lyrically ordinary. There’s nothing really worth grasping here, and nothing very memorable in it at all. “Heart of Mine” and “Groom” I have already written about, so I’ll pass those by here. Dylan’s aspersions on romantic love in favour of the love of God are, at least, somewhat on point, but the finger-pointing tone lacks generosity. He has moved on from the “I’m celebrating my love of God” phase to the “You people piss me off because you’re not joining me” phase. It’s not attractive. If only everyone who refrained from beheading babies could have songs written about them. For some reason I have a strong recollection of this song from the late-1980s. I must have had it on a tape (possibly a bootleg). It doesn’t appear on any greatest hits collections and I didn’t own this album, but I know the song well. Once upon a time I think I probably liked it, but once upon a time I thought Bruce was a majorly important cultural figure – I even watched the Dustin Hoffman biopic. Today, not so much. Though I am glad to learn that he wasn’t a baby beheader. “Dead Man, Dead Man” is a really passable song. Not a great one, but the chorus is good (especially live) and lyrically it’s pretty sophisticated. This one is worth keeping. “In the Summertime” throws me almost every time because the opening sounds so similar to “I Pity the Poor Immigrant”. It’s a nice song, but nothing memorable. Good harmonica playing. “Trouble” is a bit of a dud. The culmination of the whole album is “Every Grain of Sand”, the last track on the second side. This is his best song since Blood on the Tracks, and maybe one of his top ten of all time. The entire Christian phase is worthwhile simply for this song. It is a brilliant composition that actually expresses his Christian beliefs in a manner that makes you want to share them. It contains doubt and reverence. Tim Riley notes that it sounds like it could be a hymn passed down through the ages, and he’s exactly right. 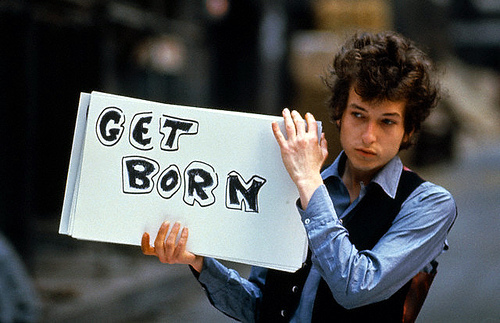 The song feels larger than Dylan, as most of his best ones do. This is the total package: it’s even one of Dylan’s better singing performances. This is a truly lovely song.